Join Chapter 16 for a night of food, wine & laughter! We are fortunate to have Wine Expert and international Wine speaker, Laurie Forster join us again to present her off-beat show where wine meets punchline! As the StandUp Sommelier,™ Forster peels back the labels of your favorite wines to expose the truth of her life in the wine business. Show includes food, wine tasting, comedy and audience games! 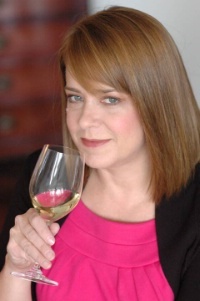 Laurie Forster is an award-winning sommelier, author, radio personality and comedian. Her edgy approach to demystifying wine has caught the eye of major networks, corporate meeting planners and high profile fundraisers around the country. Audiences connect with her down to earth “Jersey Girl” approach and find it a breath of fresh air in the often stuffy world of wine.